Video access expires August 1, 2019. 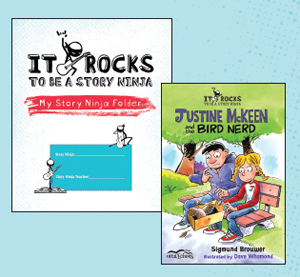 To purchase Story Ninja Programs for multiple classrooms, please contact Orca Book Publishers at 1-800-210-5277. A class set of 25 My Story Ninja Folders for each student to hold their work, remind them of the Story Ninja Moves and Tricks, and act as workspace privacy screens. A teacher folder with follow-along lesson plans, video cues and student assessment rubrics. Exclusive access to 21 short videos featuring Sigmund, who will set up the lesson plan of the day. Video access expires August 1, 2019. Plus: Each student will receive a special edition copy of a book by Sigmund. If you require more than 25 folders and books, you will be able to add additional folders in the Shopping Cart for $5 each (includes My Story Ninja Folder and book). Please order additional My Story Ninja Folders as required over 25. During checkout, you will be asked to provide the teacher’s name and email address for the class using the Story Ninja Program.